AllegroMedical.com presents The Salter-Style Conventional Cannula. In some cases a conventional style Cannula may be more comfortable for a patient with very sensitive skin or allergies. Conventional cannula with non-flared tips. Made of soft material. 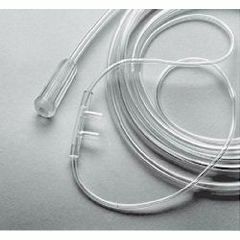 Adjustable tubing fits comfortably over the ears to hold the cannula firmly in place. Adult Conventional Style Cannula with 7' (2.13m) supply tube and three channel safety. exactly as ordered / one per package. Bought a case so it can be changed once a week for a year.